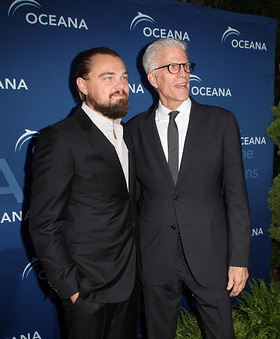 Leonardo DiCaprio, Ted Danson, Dennis Haysbert, Laura Dern, Miranda Cosgrove, Austin Nichols, Oscar Nunez, Rachael Harris and Jenna Ushkowitz attended the 7th annual SeaChange Summer Party in Laguna Beach on Saturday evening to support Oceana, the world’s largest international organization dedicated to ocean conservation. 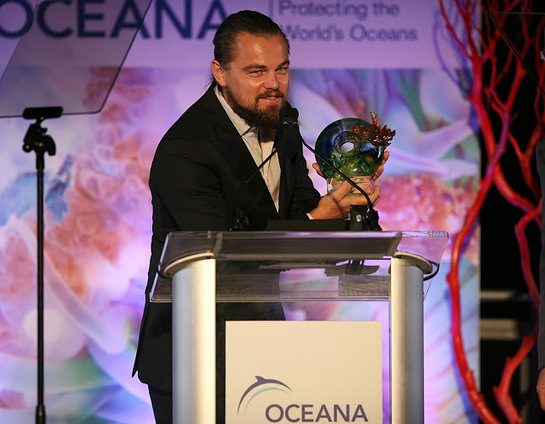 DiCaprio was honored for his continued commitment to protecting the world’s oceans at this year’s sold out event, which was held at a private coastal villa in Laguna Beach. 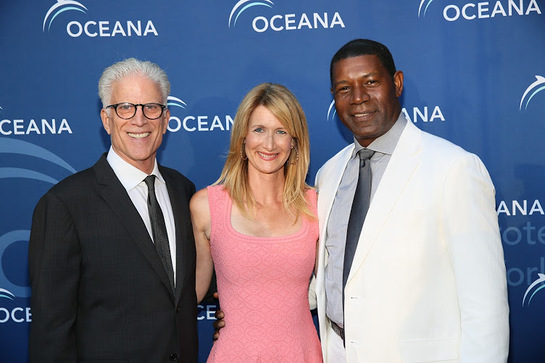 Approximately 400 guests attended the event and helped raise $1.4 million for Oceana. Leonardo DiCaprio is a longtime environmental advocate whose foundation donated $3 million to Oceana earlier this year, and made other impressive commitments in 2014 to protect the world’s oceans. DiCaprio addressed the audience: "Allow me to get straight to the point. I truly believe that saving our oceans is the most important struggle of our time. As an avid diver I’ve been lucky enough to dive in places all over the world, including Australia, the Galapagos, Belize, and Thailand. I’ve witnessed first-hand not only the beauty that our oceans have to offer a diver, but everything they have to offer humanity. SeaChange guests were treated to a sit-down dinner and presentations from Oceana executives, directors and supporters. Guests also raised their paddles in both silent and live auctions. 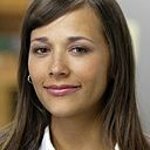 The program this year focused on protecting the waters off the California coast. California Campaign Director Geoff Shester inspired the audience by sharing how the Oceana approach has already produced results in protecting the Pacific. The evening was capped with a performance by fire dancers and party-goers then spent time dancing in the ocean breeze at the Post Party Lounge. SeaChange was co-chaired by Oceana Board Member Valarie Van Cleave and Oceana Council Member Eve Kornyei Ruffatto. “For seven years, everyone involved with SeaChange has contributed to raising millions of dollars; dollars that provide Oceana with the resources to make a direct, positive, and real impact on the oceans. We’ve raised a staggering $7 million for the oceans! We are so proud of what we have all accomplished together” commented Van Cleave. The highlight of the auction was the lively bidding for an 8-day Great Barrier Reef voyage on the HEMISPHERE, the world’s largest recreational catamaran – donated by Burgess, the World’s Superyacht specialists. Other items included Corum Watches, a Mikimoto White South Sea pearl and diamond necklace, Brioni custom suit, gorgeous handbags from Gucci, Porsche Design, Prada, Miu Mui, Giorgio Armani, Barbara Bui and Salvatore Ferragamo, Tod’s, Carolina Herrera, Versace, MaxMara, Dior, Bally, Longchamp and other South Coast Plaza Luxury Boutiques, including Loro Piana, Ralph Lauren, Bottega Veneta, and Roberto Cavalli. Stunning jewelry was featured from Chopard, Loree Rodkin, Julia Post, Lugano Diamonds, Traditional Jewelers, Kimberly McDonald, David Yurman, K. Brunini, Kimberlin Brown and more. Fabulous trips including a Galapagos adventure with Lindblad-National Geographic, Patagonia Expedition on Nomads of the Seas, Song Saa Resort, Cambodia. Stays at Montage Laguna Beach and Montage Kapalua, Las Ventanas- Cabo, Four Seasons Punta Mita and many others. A newly launched BMW i3 Electric Car was auctioned off to a lucky bidder. The SeaChange Summer Party is made possible by the generous support from various distinguished local and international businesses and philanthropists. Special thanks to co-presenting sponsor BMWi, media sponsor Coast Magazine, liquor sponsor Nolet Spirits and Kettle One Partners, and gift sponsors Bloomingdale’s Fashion Island, Nautica, Liuli Crystal Art and Orange County Pacific Symphony. SeaChange partners and underwriters include the Harriet E. Pfleger Foundation, Tricia & Michael Berns, Eve and Mike Ruffatto, Cindy & Steve Fry, Harriet & Sandy Sandhu, Julie and Peter Hill, Wendy and Rick Aversano, Konica Minolta Business Solutions, Deborah and Larry Bridges, Jean and Tim Weiss, Summer Osterman and Burgess Yachts, Center for Living Peace, The Waterloo Foundation, Laura and Lou Rohl, The Fanticola and Knode Families, Walbern Investments USA LLC and Candas and Bernie Walsh, Britt and Robert Meyer, Frequentz, Mutual of America, Gorgio Armani, Christian Dior, Deborah and Lee Drucker, Melissa and Jeff Cavanaugh, Arlene and Phil Greer, Dr. Danni Sun, Nancy and Jim Salomon and Explorocean, Delphina and Clay Berryhill, Joanne Artman Gallery, Latham & Watkins, Carol and Dennis Berryman, Leslie and Dino Cancellieri, Maralou and Jerry Harrington, Victoria Stack, Laurie Rodnick and Sir Thomas Moore, Laurie Girand and Scott McGregor, Helen and Roger Abramson, Mert Wallen and Mary Phillips, Mr. and Mrs. Mark Gordon, George and Susie Wood, Margo and Leon Smith, Barbara Streisand Foundation, Hal Harley, Marisa and Steve Robbins, Mark Biewers, Piaget, Tod’s, Diana Martin, and Signature Party Rentals. The online auction will continue until August 20th. For a full list of auction items please visit the SeaChange Party page at charitybuzz.